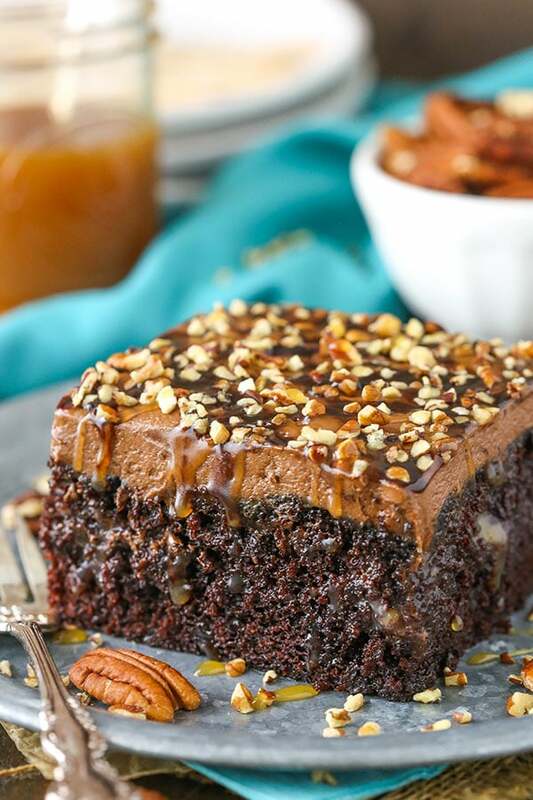 This Chocolate Turtle Poke Cake is a moist chocolate cake soaked with caramel sauce and topped with caramel chocolate frosting and chopped pecans! It’s a delicious poke cake recipe made completely from scratch! So naturally, I was pretty pumped the make this Chocolate Turtle Poke Cake and enjoy all the caramel it has to offer. It’s ridiculously good and might just be my favorite poke cake ever. 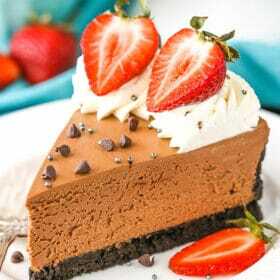 The moist chocolate cake is the same as my Best Chocolate Cake and the same one I used in my Baileys Chocolate Poke Cake. It’s amazing and always a hit. It’s covered in a wonderful, homemade caramel sauce and if that wasn’t rich enough for you, it’s covered in caramel chocolate frosting. 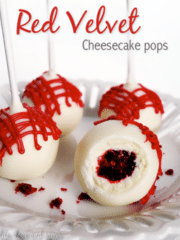 So decadent and wonderful and you have to try it. So how do you make a Chocolate Turtle Poke Cake? To get started, you’ll make the caramel that will be used in the frosting. It needs to have time to set up in the fridge before using, so we start there. It’s made in a saucepan on the stove and as far as caramel sauce goes, it’s as simple as it gets. The caramel is made from butter, brown sugar, heavy whipping cream, vanilla and a little corn syrup. If you aren’t fond of corn syrup, you could try using a little honey. Everything is cooked together over the stove on medium-low heat until the brown sugar has melted. Be sure not to rush this step or you could end up with a grainy caramel sauce. You can’t speed up the melting of the sugar, so just let it melt slowly. Once it’s melted, turn the heat up to medium-high to bring it to a boil and then let it boil for 3 minutes. When it’s done, refrigerate the sauce until you’re ready to use it. You could even make it ahead and keep it in the fridge for up to two weeks. Yay for making things ahead! The next step, crazily enough, is to make another batch of caramel – this time twice the amount as before. This caramel sauce will be poured over the cake after it’s baked. While you could make ALL the caramel sauce at the same time, it’s a lot of caramel sauce. Unless you have a very large saucepan, it’ll boil up too much when cooking and overflow if you make it all at the same time. A bit of a pain, I know. But worth it. And fortunately this caramel sauce is easy peasy and hard to screw up. After you’ve made the sauce for the cake, let it sit and come to room temperature while you make the cake. 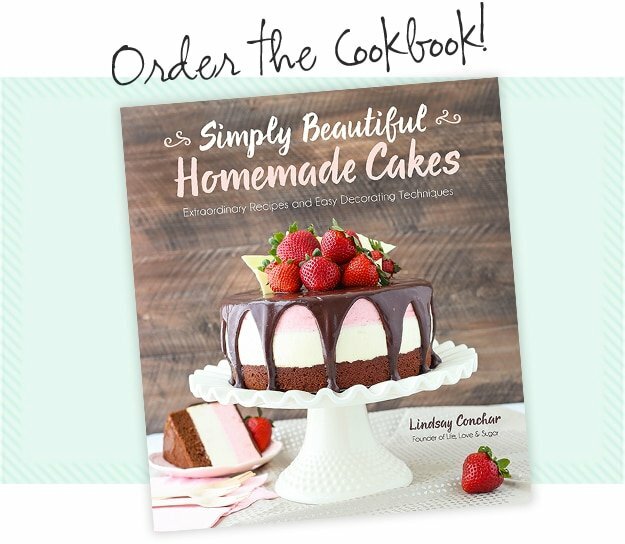 The chocolate cake is also about as easy as it gets. 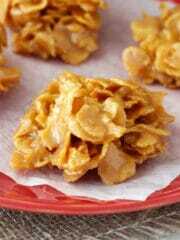 Combine the wet ingredients with the dry ingredients, add some water and bake. Don’t be alarmed when you see that the cake is baked at 300 degrees – it’s not a typo. It’s a slow bake cake with a very thin batter and it all works together to literally make the best, most moist chocolate cake you’ll ever try. 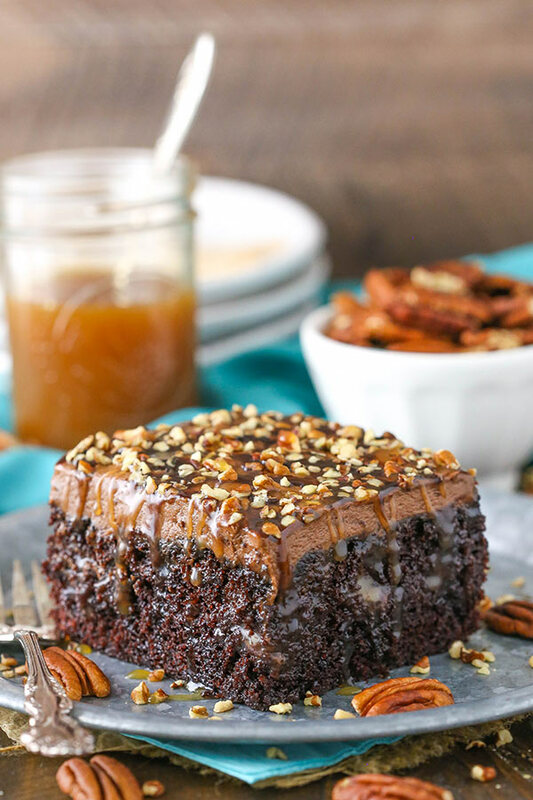 Once the cake has baked and cooled, poke holes all over the cake and pour the room temperature caramel sauce all over it, spreading the caramel evenly down into the holes. The reason for everything being room temperature is so that the caramel sauce doesn’t just all soak down into the bottom of the cake. While that would be fine, I think this cake is best when the caramel sits in the pockets that are created by the holes that are poke and if the caramel is too warm and thin, it won’t stay in those holes quite as well. If you’re like me, you want to enjoy those pockets of caramel – yum!! The cake can then be refrigerated while you make the frosting. It’s a good, old fashioned american buttercream that has plenty of caramel mixed into it. It gives it such a lovely, deep flavor that helps accentuate the caramel that was poured over the cake. It’s also wonderful because even though it’s a buttercream, it doesn’t get super firm and solid when cold. That’s a big bonus, since this cake will be refrigerated and you might just eat it cold. No rock-hard frosting here. You can eat this cake cold, or let it sit and come closer to room temperature. It’s amazing either way! 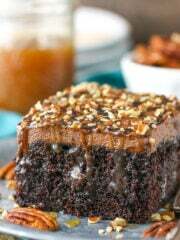 The whole cake is finished off with a drizzle of chocolate and caramel sauce and of course some chopped pecans. If I haven’t said it enough, this cake is AMAZING! 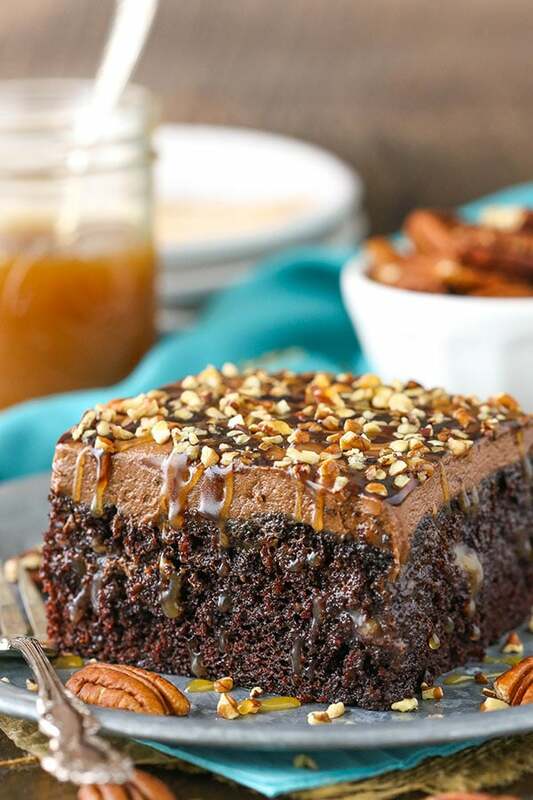 Rich, moist, full of chocolate and caramel. 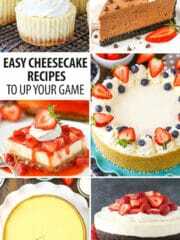 It’s like cake heaven and you definitely need a piece. This Chocolate Turtle Poke Cake is made completely from scratch! 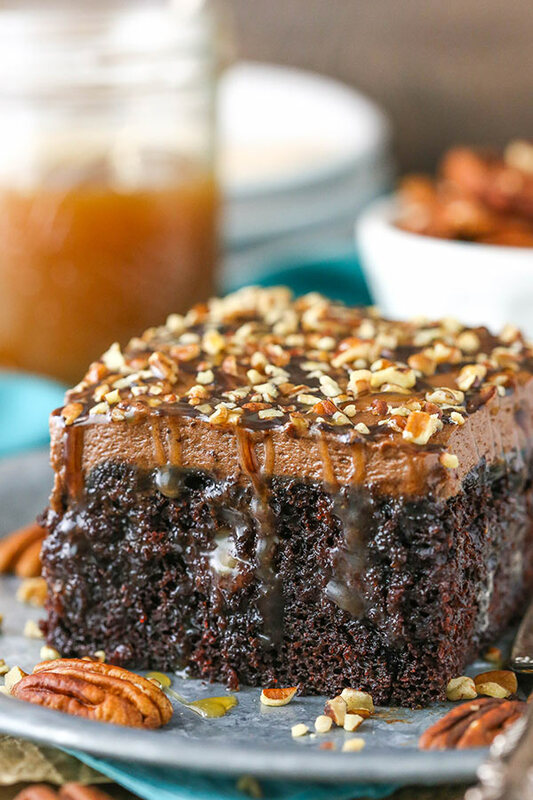 A moist chocolate cake soaked with caramel sauce and topped with caramel chocolate frosting and chopped pecans! 1. 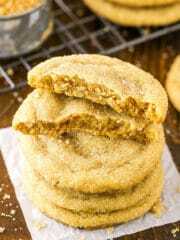 To make the caramel sauce for the frosting, combine all the ingredients for the caramel (butter, brown sugar, cream, vanilla extract and corn syrup) in a medium sauce pan. 2. Heat on medium-low until sugar is melted. Be sure to melt the sugar on a lower heat so that you don’t end up with a grainy caramel sauce. When the sugar has melted, turn the heat to medium-high to bring to a boil. 3. Boil for 3 minutes, stirring occasionally, then remove from heat and pour into a heat-proof bowl. It will bubble up a good bit when boiling. 4. Place the sauce in the fridge to cool and firm. This sauce can be made ahead and stored in the fridge for up to two weeks. 5. Prior to baking the cake, prepare the caramel that will be poured over top. Add the butter, brown sugar, cream, vanilla and corn syrup to a large saucepan. Heat on medium-low until sugar is melted. Be sure to melt the sugar on a lower heat so that you don’t end up with a grainy caramel sauce. When the sugar has melted, turn the heat to medium-high to bring to a boil. 6. Boil for 3 minutes, stirring occasionally, then remove from heat and pour into a heat-proof bowl to cool to about room temperature. It will bubble up a good bit when boiling. 7. To make the cake, prepare a 9×13 inch cake pan by greasing the bottom and sides. Preheat oven to 300°F (148°C). 8. Add all dry ingredients to a large bowl and whisk together to combine. 9. Add eggs, milk, vegetable oil and vanilla to the dry ingredients and mix until well combined. 10. Slowly pour the water into the batter, mixing well and being careful of splashing. 11. 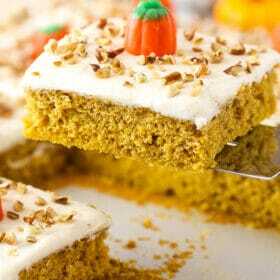 Pour the batter into the cake pan and bake for about 40-45 minutes, or until a toothpick comes out with a few crumbs. 12. Remove the cake from the oven and allow the cake to cool to room temperature, then poke holes all over. I use a knife sharpening rod, but you could also use a large straw or the end of a wooden spoon. 13. Pour the cooled caramel over the cake and spread it evenly into the holes of the cake. 14. To make the frosting, add the butter and shortening to a large mixer bowl and beat until well combined. 15. Add the cocoa powder and about half of the powdered sugar and mix until smooth. 16. Add about half of the caramel sauce (which should be cold straight out of the fridge) and 5 tablespoons of milk and mix until smooth. 17. Add the remaining powdered sugar and mix until well combined and smooth. 18. Add additional milk, as needed, to get a nice, smooth and spreadable frosting consistency. 19. 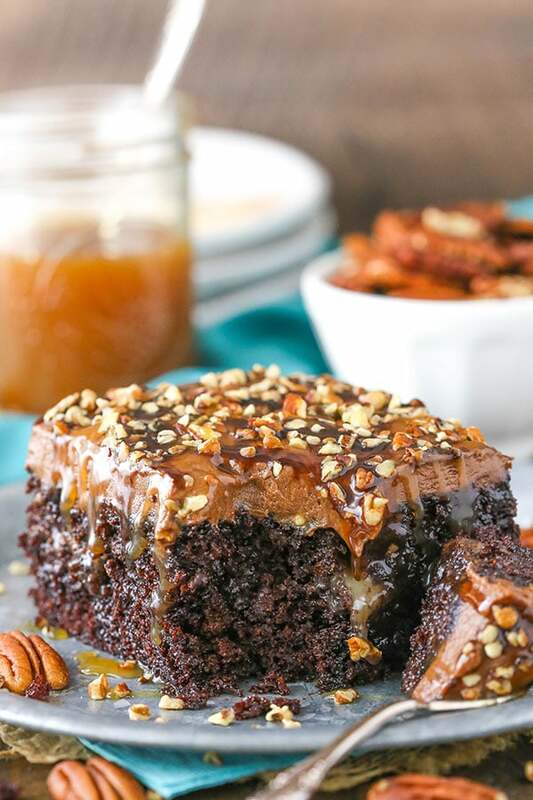 Spread the frosting evenly over the cake, then drizzle with caramel and chocolate sauce and top it off with bits of pecans. 20. Refrigerate the cake until ready to serve. It can be served chilled or at room temperature. NOTE: If you have quite a large saucepan, the caramel sauce for the frosting and cake could all be made at the same time. It makes a total of 3 1/4 cups of caramel sauce and bubbles up a decent bit while cooking, so it should be a large pan. 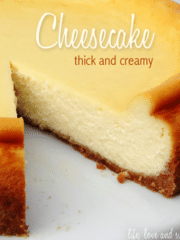 If all made together, you’ll want 1/3 of it refrigerated until cold to use in the frosting and the other 2/3 at room temperature (thickened, but pourable) for the cake. 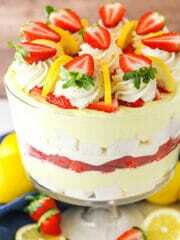 This cake looks very lovely and delicious. Can non-dairy be substituted for all of the dairy items? I haven’t tested them before to know if it will work, but it will more than likely change the texture of the cake if it does. rotation. Thanks for another yummy creation, Lindsay! Hey. Lindsay! I always look forward to hearing from you. Your recipes are usually so interesting. I had wanted to make a Christmas cake this year for my family, but this cake has changed my mind completely! I cannot wait to try it. Thanks Gloria! I’m glad you’ve enjoyed the recipes! Poke cakes are always so fun! I’m also quickly becoming more a fan of chocolate and caramel than I am of chocolate and peanut butter and that’s saying a lot. Not to mention, this 9×13 pan size will definitely fit in my “old” wall oven! But, oh how I wish I didn’t need to watch the sugar…it’s just not fair. Can I use other types of oil instead of vegetable oil (For example, butter)? 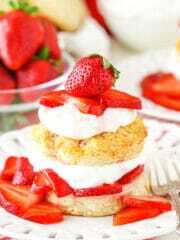 Previously, I did this for another recipe on your site and the result was very delicious. However, I think that this does not have the same result in all the Recipes. So I preferred to ask this question again to make sure. Other oils should be fine to use, such as canola oil. I haven’t tried coconut oil, so I’m not sure if that will work. I don’t think the butter substitution would work best for this cake. 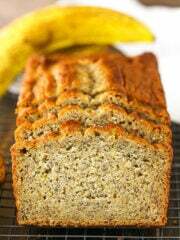 Hello, I have just discovered your blog and have been trying out the recipes. They have all turned out really good!!!! I had a question, for the frosting in this cake can I make it all butter instead of butter and shortening? Or all whipped cream? Is there a reason you went with shortening in this recipe? I’m so glad you’ve enjoyed the blog and recipes! Yes, you can used butter instead of shortening for the frosting. I often use shortening in frosting for consistency reasons. If you would like to use butter, check out my post on my standard buttercream for some tips. Thank you Lindsay. I made this cake with butter and shortening, just like the recipe. It turned out GREAT!! One thing I wanted to call out was the fact that for the Caramel you are using “SALTED” butter. 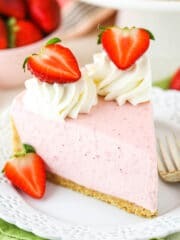 All baking recipes for the most part ask for Unsalted, so I just used that and felt that it was too sweet and missing something. Then I re-read the recipe and discovered the “SALTED” butter :). But since my caramel was already made, I just added salt till I felt it tasted good. Ps. I will check out your standard buttercream also. Can this be made the day before and refrigerated overnight?? ?